Is PlayStation VR The More Affordable Choice? Rate this Article When the PSVR was first launched, it beat the other two VR systems in the high-end VR bracket in terms of sales. Sony's market advantage was that the PSVR was a much less costly console based system rather than a PC one. Let's take a look if that advantage still holds today despite several price cut-offs that have been implemented in the VR market. When it comes to VR, quality and performance is very important that to to experience the technology at it's best means using the high-end platforms available today. Currently, there are only three VR headset manufacturers competing at this level. These are the HTC Vive, the Oculus Rift and The PlayStation VR. The first two are PC based and though they can really deliver the punch when it comes to VR, they require some high-end computer hardware which will cost a little bit more as a downside. These are not just the high performance PC's with faster CPU's and bigger RAM's but the best (of the best) GPU's or graphic cards available today. Added to this would be the peripheral control devices that may be required to take full advantage of what these VR systems can deliver. These would take the form of handheld devices like the Oculus Touch and Vive hand controllers as well as haptic data gloves and vests. The PC experience can go from hundreds of dollars to thousands depending on how much one is willing to and can spend to make a game or experience as real as possible. Recently however, both PC based VR systems slashed the prices of their basic and bundled packages which was very much welcomed and a good thing. However a price range of 400 to 500 USD is still a lot. Both the Vive and the Rift cut-back their prices 100 USD each for their basic retail package. The Vive which was priced at 599 USD is now 499 USD. The Rift is now priced at 399 USD which is also a hundred dollars lower than it's original 499 USD price. All these price cutting is good for both old and incoming customers but with the release of the updated advanced versions of both headsets like the Vive Pro and the much awaited Oculus Sta. Cruz project, prices will no doubt be much higher for the newer systems. One of the biggest advantages of the PSVR is in it's being console based. Now, unless one has plans of being a future VR developer where flexibility and a lot of open options may be needed for the headset and VR platform, a console based system would be the more practical option if one wants to use VR for gaming and the experience of it. Though the options and peripherals may be a bit limited when compared to the two PC based systems, the PSVR with the PS4 (or even the PS4 Pro) is good enough to give one an awesome immersive VR experience. What more, the biggest advantage is of course the price. The needed Giga PC for both Vive and Rift can go up to the thousand range while the PS4 is around 350 USD and the PS4 Pro at about 400 USD. That alone is a lot of difference. The PSVR uses the consoles internal GPU circuitry unlike the other two which have to depend on added GPU cards. The PSVR itself is currently being sold at a price cut-off as well. It's original price was around 400 USD but today the unit is being sold as two specific bundles one can choose from. The basic PSVR headset comes with the PlayStation Camera and demo disc 2.0. But since it is now being sold in bundle, a copy of DOOM VFR is included and the whole set will cost around 300 USD. 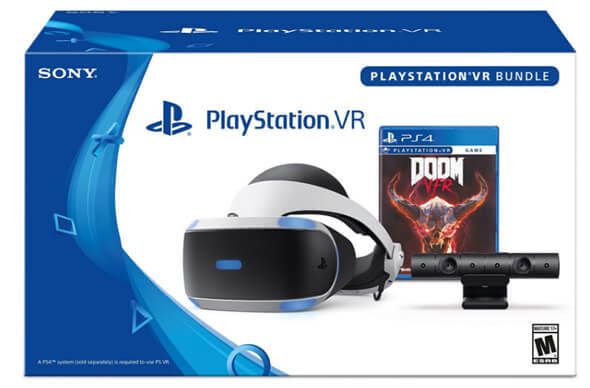 The second bundle comes with the Elder Scrolls 5: Skyrim VR instead of Doom. Also, two PlayStation Move controllers are included as well. This however, does raise the price to around 350 USD. If practicality won't do it, the price alone will. Sony has a lot of content accumulated for its consoles through out the years and some of these are being adapted or translated to the VR platform. Many content developers have already partnered with Sony to take advantage and continually supply the strong and huge market that the PlayStation has. As things stand today as when it was first launched, the PSVR remains the most cost effective VR system in the high-end VR market to date despite all the price cut-offs.